These companies want to minimize their fuel and time usage, to reduce their costs and ecological footprint. Sounds easy, right? Just take the shortest route. Unfortunately it’s not that simple... Let’s take a closer look. 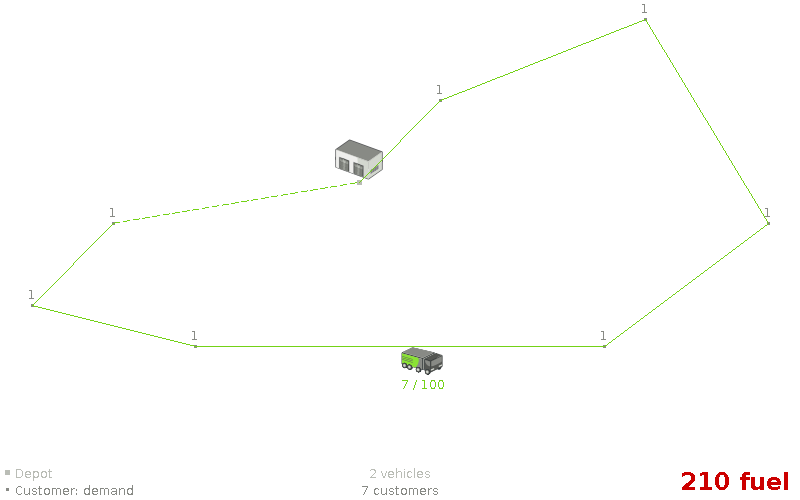 This optimal solution requires 210 fuel (which includes each vehicle driving back to the warehouse). Notice that we only use 1 vehicle. Let’s continue from that assumption. 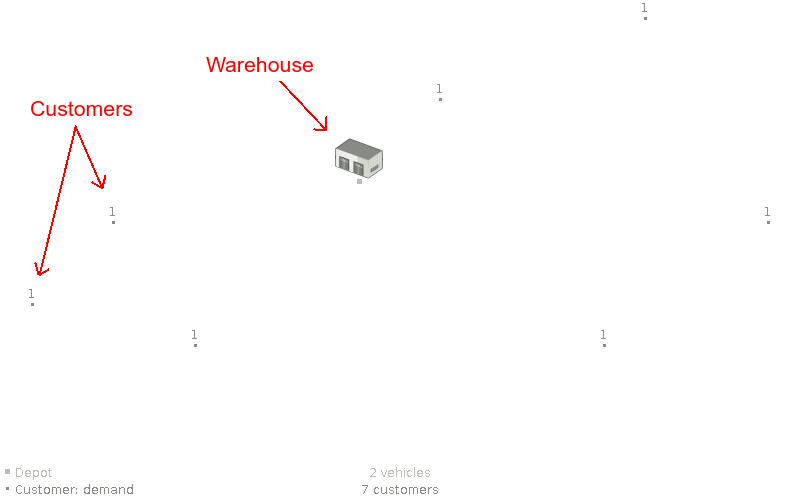 In a real-world delivery/pick up scenario, each customer needs a number of items, but a vehicle’s capacity to transport items is limited. This optimal solution requires 224 fuel, which is - of course - more than the 210 fuel of the previous solution. 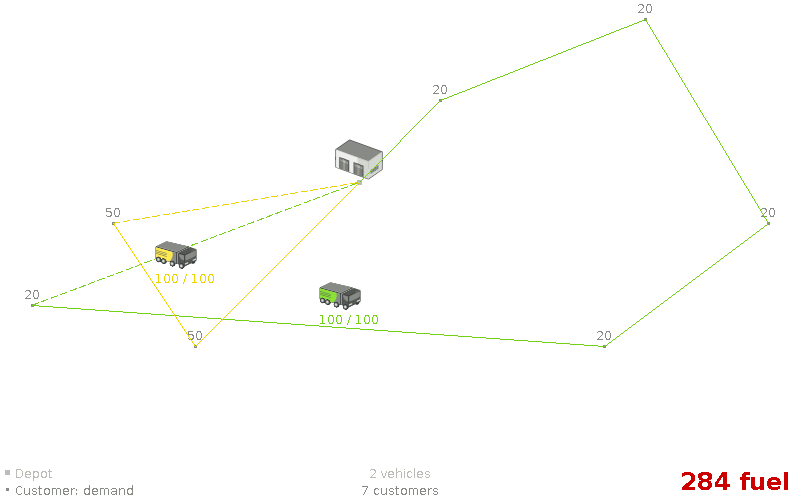 The yellow truck transports 60 items and the green one 80 items. Notice that none of the lines cross. Let’s assume that’s always the case. Let’s see what happens when some of the customers require more items than other customers. 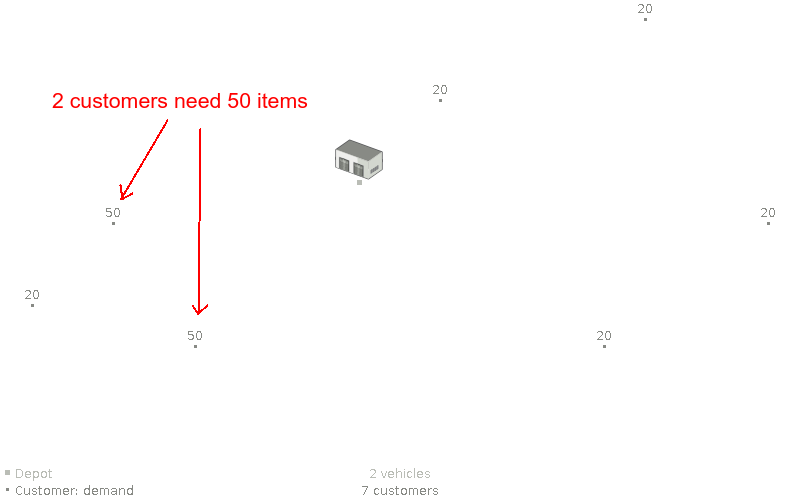 In this case, 2 customers need 50 items and the other 5 still need 20 items. 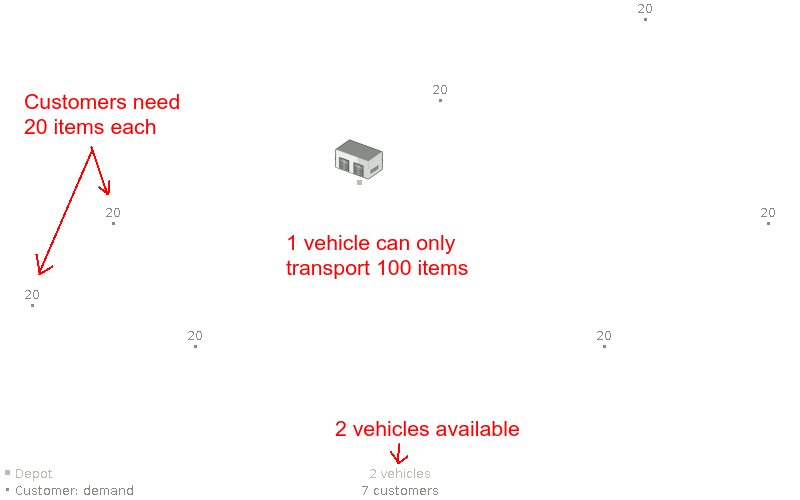 So the previous solution is infeasible because the yellow truck would need to transport 120 items. The optimal solution now requires even more fuel: 284. We found a feasible solution with 2 vehicles. So we don’t seem to need any more vehicles. 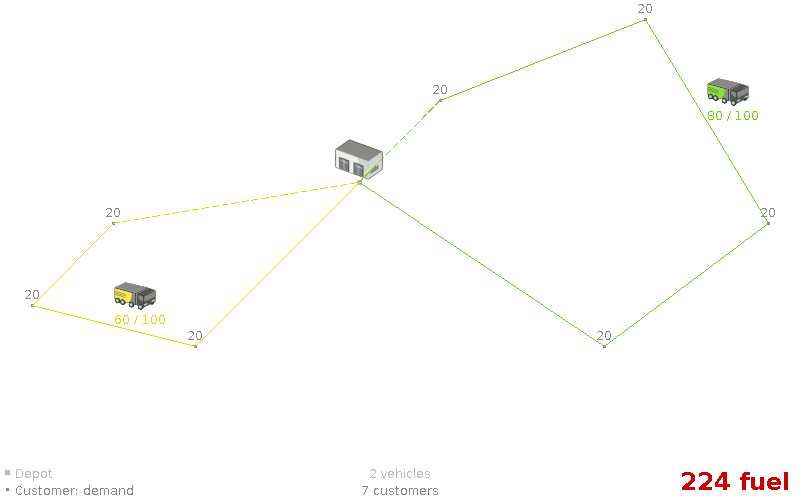 By adding an extra vehicle, the optimal solution now uses less fuel (274). This is a paradox: buying more vehicles can reduce expenses. Notice that in both solutions above, no vehicle crosses its own line. In any real-world scenario, time is of the essence. 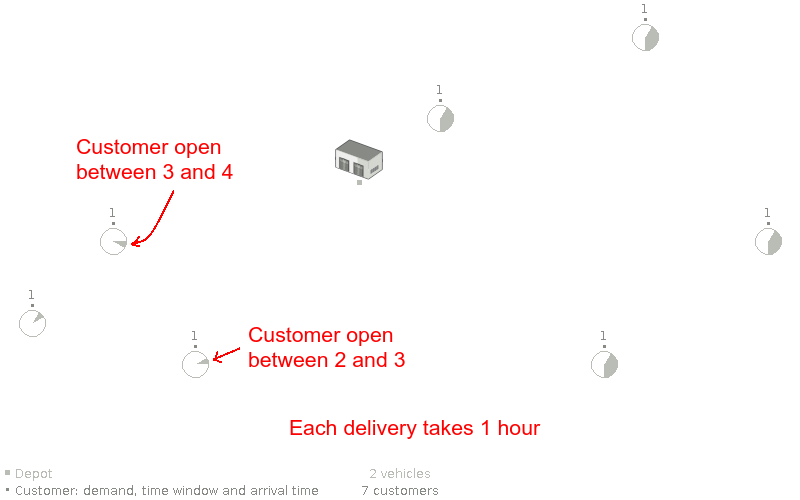 Items need to be delivered on time, within the time window of each customer. 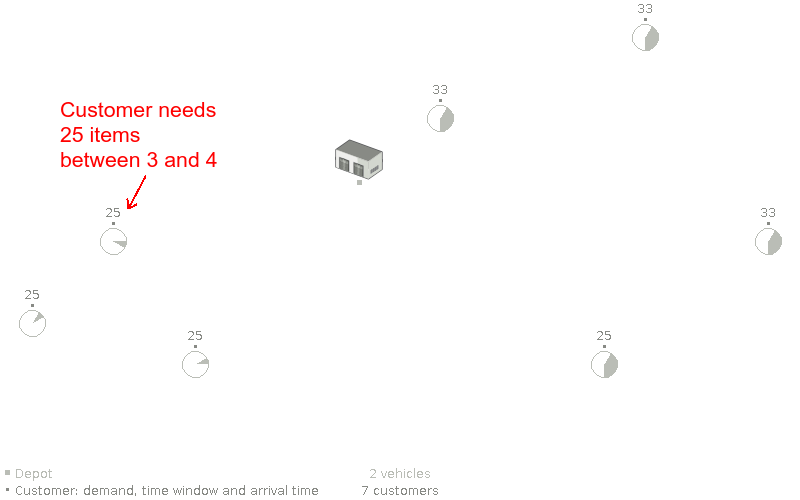 In the case above, a vehicle needs to arrive at the top left customer between 3 and 4 o'clock. Different customers have different time windows. 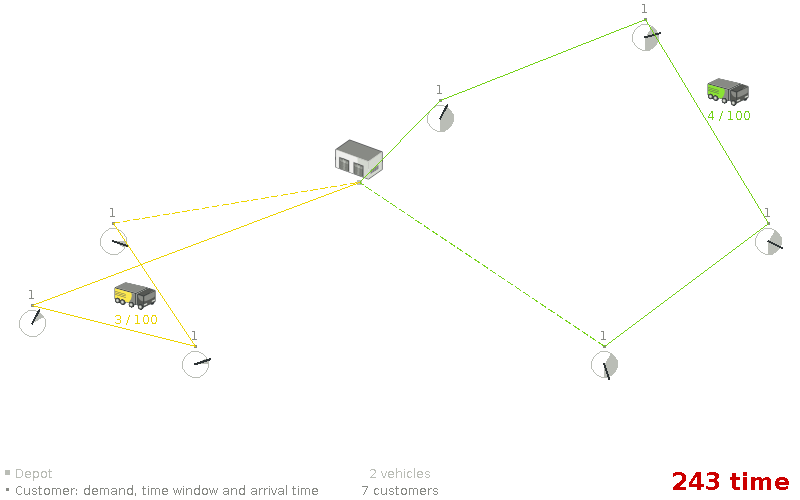 For example, all 4 customers on the right are flexible: they are available between 1 and 6 o’clock. Additionally, each delivery/pick up/repair at a customer takes 1 hour to complete. 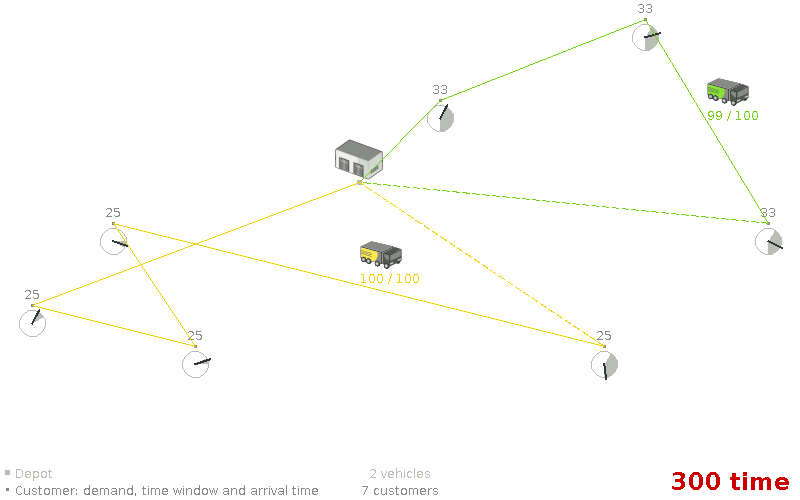 In the optimal solution, the yellow truck arrives at the most left customer at 1 o’clock. An hour later it leaves for the bottom left customer at which it arrives at 2:20 (because driving takes some 20 minutes). Again an hour later it departs and arrives at its 3th customer at 3:40. Notice how the time windows pretty much dictate the route, especially on the left side. The optimal solution now puts the bottom right customer in the yellow truck, because there was no more room in the green truck. 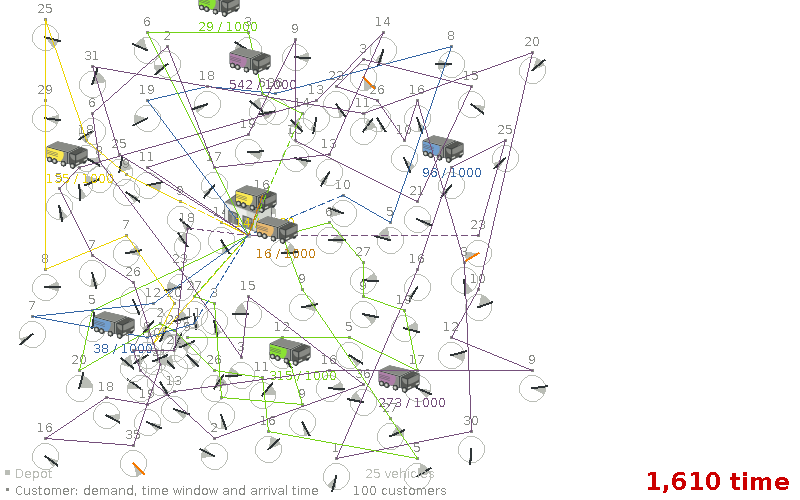 All screenshots are taken from the OptaPlanner vehicle routing example.